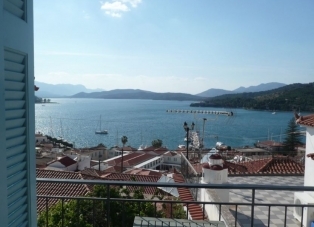 Imagine your Greek island holiday... White painted streets, a bustling harbour packed with cafes and shops, and tavernas with sea views...Welcome to Poros. 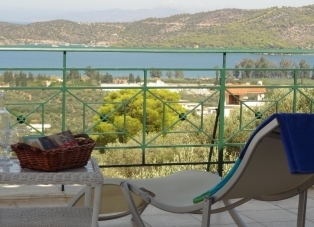 We have handpicked holiday villas and town houses in Poros Town, apartments at Askeli and Canali beach and a small selection of villas in Galatas, a stone’s throw from Poros Island. 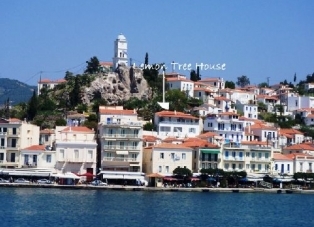 The island of Poros is in the Saronic Gulf and is actually located just a couple of hundred metres from the mainland where you have the town of Galatas. The island ideal for families seeking a relaxing holiday away from mass tourism with beautiful scenery, rugged coastline, sandy cove beaches. 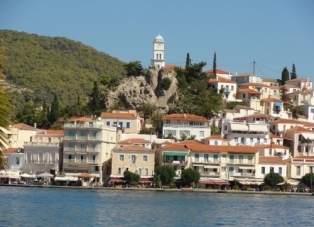 Poros Island has it all; lovely beaches, pastel painted cottages, magnificent coastal path views, ancient ruins and white stone churches and a choice of uncrowded beaches. With many fantastic waterfront restaurants as well as traditional Greek tavernas located in the square, you really are spoilt for choice and if you want to check out the mainland there are boats going 24 hours a day which will cost 50 cents per person. Imagine your Greek island holiday... White painted streets, a bustling harbour packed with cafes and shops, quiet backwaters of narrow streets and tavernas with sea views. Pastel painted cottages, magnificent coastal path views, ancient ruins and white stone churches and a choice of uncrowded beaches.. Welcome to Poros. 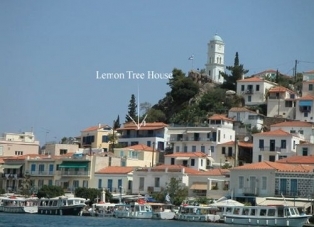 Poros Town`s water edge tavernas serve good food prepared for you from local produce - wine, fish, meat, fruit and vegetables. Galatas is just a stone throws throw away over the water where Pomegranate, orange and lemon groves adorn the hillside. The pace is slow, supremely relaxed and you are in no hurry. The service and value is superb. Poros is just one hour from the port of Athens by fast ferry and for added exploration the mainland is just 2 minutes across the water. See view of "sleeping lady" mountain range from Poros. Nearby islands in the Saronic Gulf are Hydra, Spetses and Aegina, all of which can be accessed via fast ferry from Poros. If you want to island hop further afield you can nip back to Athens and take a ferry to a whole host of other islands including Mykonos. If you like the idea of a sailing and land-based holiday we can recommend yacht chartering services from the harbour where you can also hire a skipper to take care of you. Villas with pool and yacht chartering are available on the mainland at Ancient Epidavros and on the island of Zakynthos in the Ionion group of islands. Experience real Greece in the Saronic Gulf and enjoy the magic of Poros and its many surrounding islands while being just 1 hour from Piraeus (Athens). Haven on Earth has personal knowledge of the Saronic islands and will do their best to make your holiday a positively enjoyable experience. For those who enjoy dining out they will be spoilt for choice along the harbour and beachside with waterfront restaurants offering friendly service as well as fantastic sea food. There are many historic sites to visit and with the mainland at Galatas less than 3 minutes across the water there is plenty of opportunity for exploration. Poros is ideally placed for an island hopping experience with fast or slow ferries at the harbour waiting to take you to other Saronic islands or back to Athens from where many more islands can be visited. 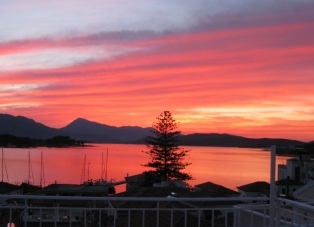 Discover Poros.. the Athenians` best kept secret.